lonis is using Smore newsletters to spread the word online. Buddhism originated in India in 500 B.C. and was based on the teachings of Siddhartha Gautama. Buddhism spread to China and korea in 500 A.D. After it had spread China introduced Buddhism to Japan. Buddhism spread very quickly throughout Japan because Prince Shotoku had supported Buddhism very much. Buddhism also had a big impact on Japanese culture. 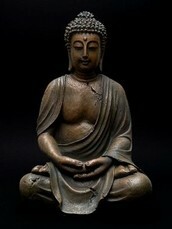 Buddhism then had developed in Japan over centuries making it even more popular. Zen Buddhism started in the 1100's. The word Zen mean medication. Zen was very simple and easy to master. when Zen was introduced to Japan it gave a huge impact on Japan.